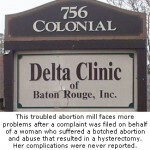 NEW ORLEANS (AP) -- A federal judge fined the Delta Women's Clinic -- the longest functioning abortion clinic in New Orleans -- $337,000 for letting three doctors prescribe and dispense drugs without being registered to do so at that location.The doctors also were fined a total of $278,000 by U.S. District Judge Adrian Duplantier, who handled a civil suit filed last summer against the clinic and the doctors by the federal government. Louisiana Medical Board Disciplinary Document -- Dr. Work can't practice medicine for 1 year. 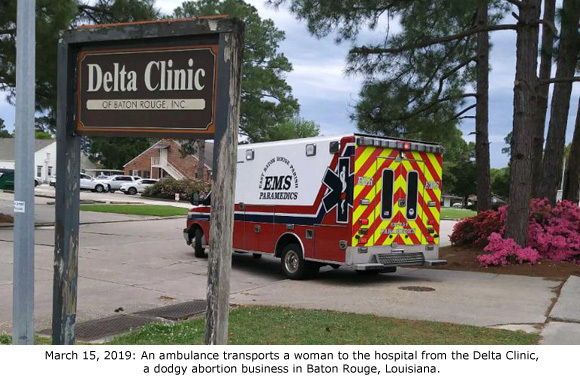 2019 Louisiana corporate registration profile for Delta Clinic abortion clinic. Note corporate license has been revoked multiple times. See page 2. Deficiencies & plan of correction - 102 pages. Multiple medical license discipline documents for Kevin Work, MD from the state of Louisiana. 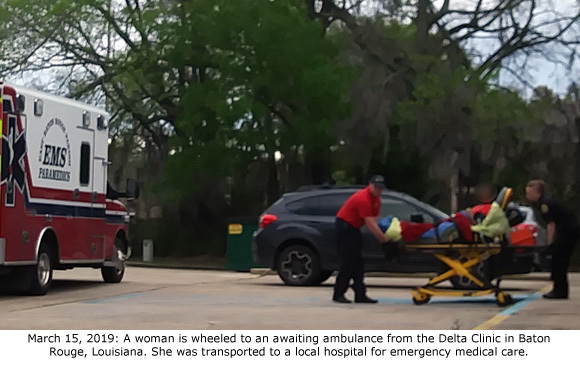 ADF attorneys ask that the Department of Health and Hospitals shut down the Delta Clinic in Baton Rouge, based on findings that the facility's actions created the substantial possibility of serious harm or death to patients. Alleges incomplete medical abortion, rude clinics staff behavior, battery by the abortionist Gardner, surgical abortion without anesthesia in order to clean up after the failed medical abortion and punish patient for requiring additional care. Case closed without action or notification to complainant in July, 2011. Link to all disciplinary documents for Kevin G. Work, MD. Louisiana Medical Board Disciplinary Document. Dr. Kevin Work is placed on 2 years probation. Appeals court decision in Caceras v. Work malpractice case. Glenda Caceras sued Dr. Kevin Work and other defendants because Dr. Work's nurse allegedly gave Mrs. Caceras medication which caused her to suffer a miscarriage. See pages 2-3. Dr. Kevin Work and Canal Women's Clinic are sued. "A women’s clinic is being sued by a patient who claims it allowed an unlicensed doctor and a suspended doctor to practice medicine and fraudulently attempted to conceal that they had botched a post-childbirth surgery." 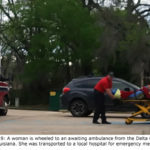 "Luz Aleyda Aguilar filed suit against Kevin Work M.D., Adrian J. Coleman, M.D., Norman Torres M.D., Canal Women’s Clinic, Ochsner Medical Center-Westbank, Louisiana Patient’s Compensation Fund, Louisiana Medical Mutual Insurance Company and their insurers in the 24th Judicial District Court on April 17." "Aguilar claims she was referred to Torres who the clinic held out to be a licensed doctor and who had a blank prescription pad provided to him that allegedly had been signed by Work so that Torres could write medications to patients. In addition, the plaintiff alleges that Coleman, who is now deceased, had his medical license suspended, but was still allowed by the clinic to deliver babies, including during her childbirth. Aguilar asserts that by allowing unqualified doctors to oversee her childbirth she was disfigured in post-childbirth surgery and later she contracted an infection requiring a second surgical repair. In addition, the plaintiff claims she was at a disadvantage for finding out about the alleged mistreatment because the defendants knew she could not speak English." 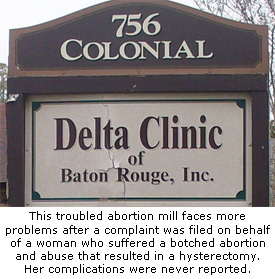 Compilation of safety violations, patient injuries, deaths, and botched abortions at the Delta Clinic. Includes names of multiple alleged abortionists at Delta Clinic, including Kevin Work. See page 10. LA Congressman Boustany requests the Department of Health and Hospitals to release documentation showing that Delta Clinic falsified documents and withheld information to protect child predators and rapists. Letter dated March 17, 2011, from the Department of Health and Hospitals referring numerous violations by Delta Clinic to District Attorney Hillar Moore for possible prosecution. Witness Affidavits from four former Delta Clinic employees, July 1999: Each sworn witness describes similar personal observations of filthy, unsterile, and dangerous conditions at the Delta Clinic. Multiple witnesses describe clinic personnel using rusty, blood-stained instruments in abortion procedures. Witnesses also describe being disturbed at the standard clinic practice of reusing "single use only" equipment on multiple patients instead of discarding it after each procedure. In addition, multiple witnesses describe unlicensed clinic staff illegally administering drugs, and constant problems with overmedicated patients and botched abortion procedures. Multiple patient complaints in online reviews for Kevin G. Work, MD.